Apple CEO Steve Jobs is apparently interested in making another run at getting his wildly popular iPhone onto the world's largest mobile carrier, China Mobile. According to a Reuters report, Apple (AAPL) may need to be more accommodating in its negotiations this time around, given the rapid rise of archrival Google's (GOOG) Android mobile operating system and a desire to maintain the iPad's lead against an increasing onslaught of tablet computer competitors. China Mobile Chairman Wang Jianzhou told Reuters that "Jobs has said he's very interested in developing an iPhone that will run on TD." In order to get on China Mobile's (CHL) network, an iPhone would have to be reconfigured with a different chipset. China Mobile uses a 3G Time Division Synchronous Code Division Multiple Access (TD-SCDMA) chipset, which is different from Apple's current technology. China Mobile is currently testing its fourth-generation network, the report noted. Apple proved that it could revise its design to accommodate a new chipset when it struck a deal with Verizon Wireless earlier this year to carry its iPhones on Verizon's Code Division Multiple Access (CDMA) network. Apple previously only equipped its iPhones with chipsets to work on Global System for Mobile Communications (GSM) networks. In the past year, Apple has faced imposing competition from Android-based smartphones. In the third quarter, Apple's mobile operating system, iOS, saw its market share slip for the first time, as Android pulled further ahead. Apple later announced its Verizon (VZ) deal, breaking away from its previous exclusive U.S. carrier relationship with AT&T (T). The iPhone is now sold by both carriers, and Apple last year also distributed it through big-box retailers like Walmart (WMT), Best Buy (BBY) as well as Radio Shack (RSH). These additional distribution points not only bode well for its iPhone but also for its year-old iPad, which just this week got a refreshed design and new name: the iPad 2. Apple is currently the dominant player in tablet computers, but a slew of competitors began emerging late last year with product roll-outs or announcements of plans to enter the market. As a result, a more accommodating negotiating stance may serve Apple well with China Mobile, which serves 589 million mobile subscribers. In early 2009, Apple and China Mobile failed to strike an agreement after undergoing three rounds of talks over the course of 18 months, according to a ZDNet report. The negotiations reportedly deteriorated over Apple's iTunes App sales, for which the computer maker wanted to be the bill collector, rather than China Mobile. Six months later, China Mobile was touting plans to introduce a series of phones based on Google's Android, dubbing the devices "OPhones," notes a Bloomberg Businessweekreport. 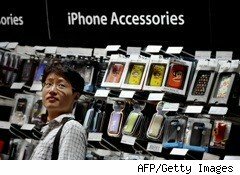 Apple, meanwhile, landed a deal with the country's second-largest carrier, China Unicom. Despite the earlier failed talks with China Mobile, it appears the stars are aligning based on Apple's moves in the U.S. The computer maker may ultimately decide now is the time to export its Verizon-iPhone idea over to China, before Google's Android gains more ground.